From Lady Wulfruns collection. One for the Plymouth purists. Another acquired slide, but one that is sadly beginning to deteriorate, so a good time to commit it to the digital archives. No date or location on the slide, but I'm sure someone will be able to recognise where PCT No111, a 1958 vintage MCCW bodied Leyland PD2/40, OCO511 is parked in this view. 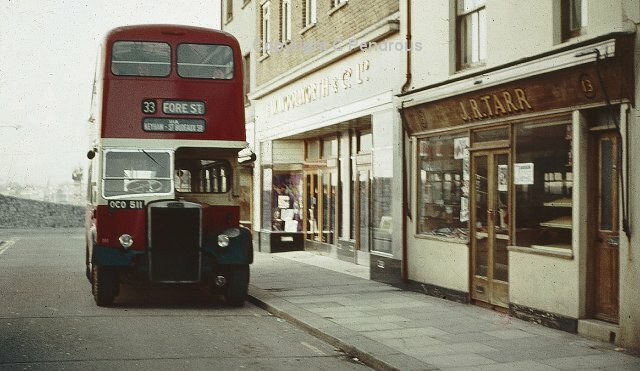 This is Fore Street in Devonport, the then terminus of the 33. This is now a pedestrian precinct. Woolies closed many years ago as they all will be soon. A classic shot of a bygone era. The guess is that must be from the early 1970's. For many other fantastic photos from all over the country - the Lady has a well deserved fan club! I should have made it clear that the bus is facing towards Granby Way and not the photographer. Sorry for any confusion.